I need to put my focus on being creative. I need to create something new each day. It doesn’t matter what—I simply need to focus on the planning and joy of creativity. Mary Atkins was a young mother of two small children when her husband was tragically killed in a light aircraft accident. Her body, already exhibiting signs that something was amiss, bore the brunt of this tragedy and at the age of 27 she was diagnosed with multiple sclerosis. Doctors told her she would be wheelchair-bound within months. Instead, Mary recovered. Her journey to wellness began when she acted on a powerful intuitive voice that suggested she undertake a strict daily program of creative expression—to plan, create or do something she had never done before. Within twelve months she could once again walk without aids. She has now been in full remission from MS for more than fifty years. 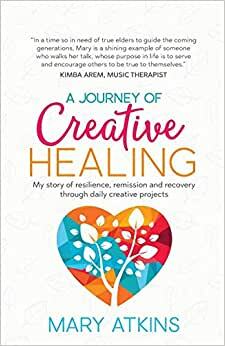 In A Journey of Creative Healing Mary shares her remarkable story—and those of other survivors who have endured equally debilitating emotional and physical shocks—and reveals how listening to your intuitive voice, exploring creativity in all its guises, can deliver recovery from overwhelming grief and profound illness. By following her six steps to healing Mary believes you too can find your way home to health. Start reading A Journey of Creative Healing on your Kindle in under a minute. Mary Atkins is the author of Finding Your Voice: Ten Steps to Successful Public Speaking and Losing You, a novel about overcoming adversity and the redemptive power of love. A Home Economist she is the Past President of the Australian Association of Food Professionals. Mary is also an award-winning speaker who currently travels the world lecturing on cruise ships. Personal tsunamis have occurred in people's lives right across our planet and throughout history. For many such an event is so devastating they never recover. But that was not the case with Mary Atkins. Mary has written a beautiful, honest and inspiring story of recovery and it should be read by anyone faced with adversity. In modern society the voice of the traditional wise woman is no longer silenced. Mary speaks with confidence about the role intuition and creativity played in her transformational healing journey. Her book is thoroughly researched with citations from contemporary writers and inspirational quotes from traditional sources. The example of Mary Atkins' life journey is testament to the ancient Greek maxim, 'Know thyself'--and the positive outcomes that ensue, if one has the courage to walk that path. This is a well written and very readable book about healing by Mary Adkins. The writer had MS but the healing methods she used could be applied to other illnesses. I read the book and bought it again for a young mother with MS.